The first time I met Christine of The Wild Way, it felt like I had known her for years. She greeted me so kindly, (even mentioning my photography), and kept the biggest smile on her face while slinging each drink for the line of customers behind me. The second visit was during a heatwave in KC, and even with Jon making repairs to the trailer that day & Christine powering through, still making drinks, happiness continued to pour out of them. The more I frequented this spot off 31st & Gillham Rd., the more I realized just how special it was. Jon & Christine bonded over cups of coffee, tea and good conversation their senior year in college, and a dream to one day open up a shop of their own was set to become a reality quicker than they thought. First, Christine landed a barista job in Austin Texas for Cuvee Coffee that quickly led her to a GM position by the time she was 24. 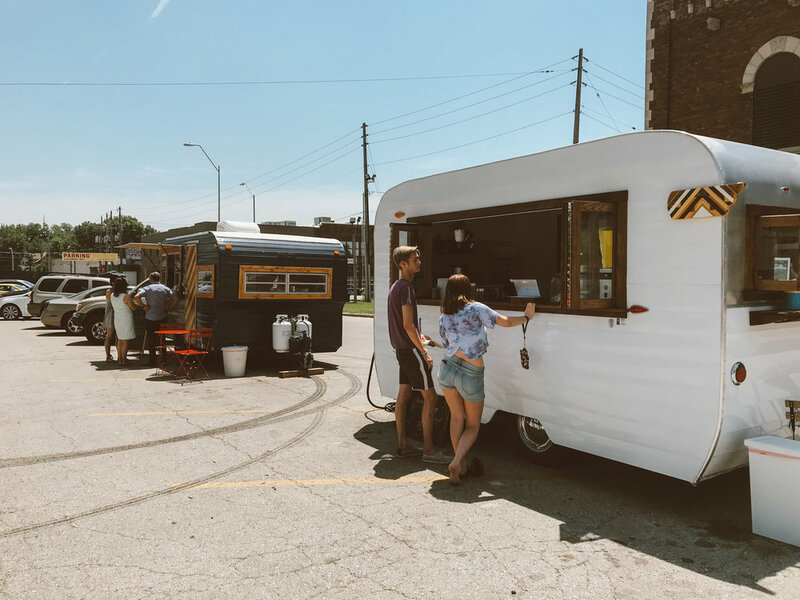 After tying the knot, saving funds, and researching their next move, the chase to pursue their coffee dreams was moving them to Kansas City. 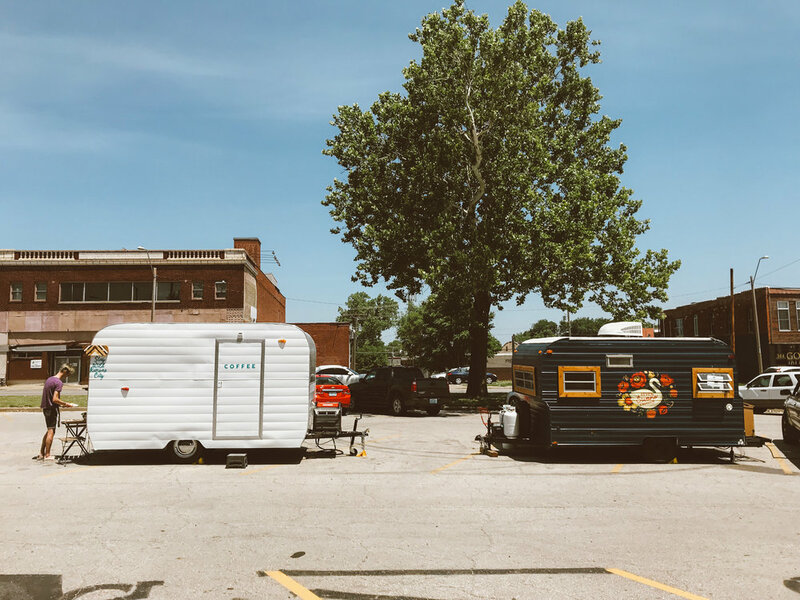 Officially opening their little coffee trailer doors April 13th of this year, the mission has been to take the road less traveled; to take the wild way. I was already so impressed by the customer service and every little detail they have poured into their mobile coffee trailer, but then… one day, I ordered the purple drank. 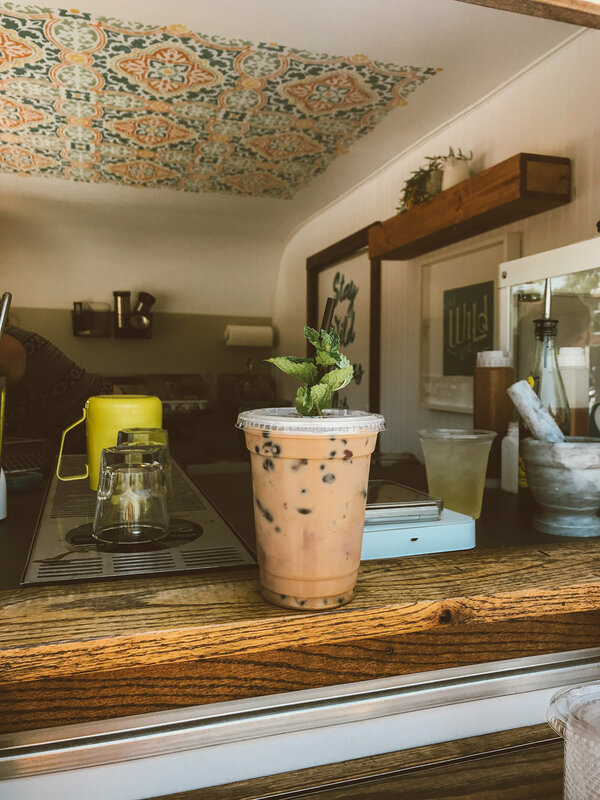 This seasonal drink is crafted with muddled blueberries, mint leaves, raw local honey, espresso, milk & ice. Coming from a gal who’s normal go-to is an iced americano, this quickly became my ‘treat-yo-self’ coffee drink of choice. I love that they make their own syrups from fresh ingredients– you can definitely taste the difference, too. You can find their full menu on their website, as well as a link of where to find them throughout the week! *Bonus alert — every Friday from 7 a.m. to 2 p.m., you can find the Seven Swan Creperie trailer next to The Wild Way coffee! Kate Bryan offers a handful of sweet & savory options (my personal favorite has bananas & nutella). Her story has been over 15 years in the making! Catch them both at the corner of 31st & Gillham Rd in KCMO, (in front of El Torreon).